The waterproofing experts at Arizona Foundation Solutions can install a crawl space waterproofing system that addresses all your needs. We make it easy to repair your wet crawl space by providing a free inspection and estimate. As Greater Phoenix & Statewide's trusted waterproofing contractor, we serve Scottsdale, Mesa, Phoenix, Glendale and the surrounding area. 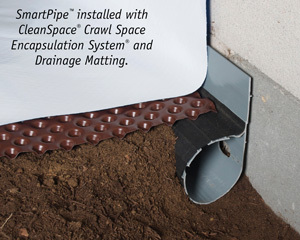 The best time to install a crawl space waterproofing system is when the crawl space is being sealed or encapsulated. The air and vapor barriers used in the encapsulation process prevent moist exterior air from entering the crawl space and condensing on crawl space surfaces. A waterproofing system will capture water that seeps through crawl space walls and floor areas, transporting this water to a sump pump for automatic ejection to the exterior. 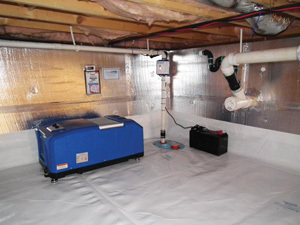 The final ingredient in a complete crawl space waterproofing system is a SaniDry® crawl space dehumidifier. A crawl space dehumidifier isn’t required in all cases, but one may be necessary in a large crawl space or a crawl space that has been wet for a long time. An ENERGY STAR® SaniDry™ dehumidifier is designed to easily handle the temperatures and harsh crawl space conditions that can overwhelm standard “appliance store” models. Interested in our crawl space waterproofing or crawl space repair services? Contact Arizona Foundation Solutions today for a free estimate, offered to customers in Phoenix, Mesa, Glendale, Scottsdale, Chandler, Scottsdale, Payson, Sedona, Peoria, Prescott, Flagstaff and nearby Arizona. Give us a call at 1-602-598-5603 or contact us online.